The Peter and Paul Fortress is the original citadel of St. Petersburg, Russia, founded by Peter the Great in 1703 and built to Domenico Trezzini's designs from 1706 to 1740. In the early 1920s, it was still used as a prison and execution ground by the bolshevik government. Today it has been adapted as the central and most important part of the State Museum of Saint Petersburg History. The museum has gradually become virtually the sole owner of the fortress building, except the structure occupied by the Saint Petersburg Mint. 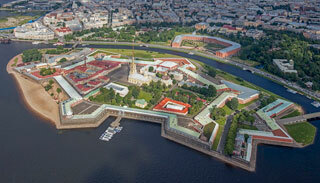 This article uses material from the Wikipedia article "Peter and Paul Fortress", which is released under the Creative Commons Attribution-Share-Alike 3.0 License.